Is Sriracha Sauce Vegan? – Is It Vegan? Edit: It has been brought to my attention that Sriracha is now more than just a brand sauce. 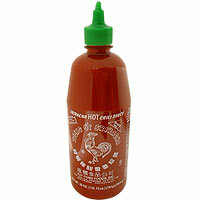 Other brands make sriracha and have been known to add shrimp paste. Please note, Huy Fong, the dominant provider of Sriracha Sauce, does NOT have shrimp paste or fish sauce. ← Is Xanthan Gum Vegan? What about asking “Is it good for me?” Then the answer would be different. Vegan is good and great and definitely how I roll, but healthy is just as important. Look at those ingredients. Sugar is second on the list. That means it’s theirs a ton of it in there. And what about potassium sorbate and sodium bisulfite? My rule — if a product has stuff in it that I know is bad for me, it’s out. If it has stuff in it that I can’t point to in nature, it’s gone. If it’s got stuff in it that I don’t know what the hell it is, can’t buy it in the store, or can’t grow it . . . . it ain’t going into my body. Let’s not just be vegan. Let’s be healthy!!! I am vegan also for the animals but, I also take care of myself because if I stay healthy I can help the animals better than if I am sick. Besides, if we get sick, they always say it’s because we are vegans and that is another reason for us vegans to eat as healthy as we can. You have an excellent point, Sukie!! How are we sure that the sugar is vegan vs. bone char sugar? I wouldn’t touch this stuff with a ten foot pole bc it’s horrible for you and I follow 811 anyway, but what about vegans who are vegan for animals alone? Do we have clarification from the company that this sugar is vegan?? I emailed the company explaining that not all sugar is vegan. “Thank you for your email! 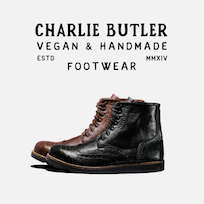 unfortunately, our product is not vegan. SOME sugar is not vegan. That seems to be mostly a US thing, where they bone char filter it, but here in Australia (for example) that process is unheard of. Not to nitpick, but if you ate everything that nature intended you to, you would be using those canines for their intended purpose. Vegans are not more healthy than vegetarians or normal meat and potatoes people, no matter what you say. Vegans and vegetarians can certainly be just as unhealthy as anyone. But I will contend with the point that vegans and vegetarians are much more conscious of what they eat and what they put in their bodies. I wonder what the ratio o fMcDonalds Dollar Deal eaters to super unhealthy vegan donut eaters is. I’d guess less, much less. Nature does not “intend” anything, because nature is a concept, not a person. But even if nature _did_ intend consequences, then it seems you would be committed against use of the Internet, because… you know… it’s not natural. If you respond by claiming that anything humans do is natural, then veganism is natural. You say that vegans are “not more healthy than … normal meat and potatoes people, no matter what you say.” Really? No matter _what_ we say? You are saying that we could provide a litany of evidence in favor of the health superiority of a vegan diet, and you would simply dismiss it? Breathtaking. If you don’t mind, I’m going to place more weight on the available scientific evidence than your anecdotal gibberish. @adam that is entirely untrue. Read Colin t. Campbell read the starch solution by dr.mcdougall those who follow a high carb mostly raw vegan diet are vastly superior in health. Meat and dairy cause cancer. This has been proven. So even if one is just follows a standard vegan diet with no extra attention paid to health, their diet and health will still be better than a vegetarian or meat eater. 1 – incisor teeth are for cutting food such as apples. 2 – vegans are healthier than meat eaters. 1 example of that is cholesterol level of meat eaters. i’ve been vegan a long time. ive heard a lot of meat eaters, including you, rationalize why they are right, and i’m wrong. really, it comes down to will power. eating meat, cheese, etc. is an addiction which most people can’t give up. Do you know if the sugar is bone char sugar or not? this is the question that i cant seem to get answered. people really love to avoid this part of the equation. im not convinced that Sriracha is vegan until the sugar issue is cleared up. im just going to assume its NOT vegan until then. The sugar used in Sriracha is beet sugar. Beet sugar is never processed with bone char. We are using beet sugar for our Sriracha sauce. comments please do not hesitate to e-mail us. Thanks for this, Terry! I’d put off buying/using this thinking it was not vegan. I never eat processed sugar, because it’s not vegan, nor is it healthy, but I suppose I’ll do the beet sugar. thanks Terry. only took me a year to read your response. I guess its not so odd that the just list it as “sugar” instead of beet sugar. good to know though! But are the beets grown veganic? Being Vegan is about intention, not perfection. People get too caught up in chemical names.. I hope there’s no dihydrogen oxide in it! What about the xanthan gum, is there any way to tell if it is made from glucose, sucrose, our lactose? Xanthan gum question is what im asking also? LOLsies at the Dihydrogen Oxide comment!!! That’s water people. Not at chemicals are bad, the human body is full of them! Eat it in your quinoa and have a freaking nice day! If your indulgence is a hot sauce a few times a week when you’re eating vegan and health conscious, I’m going to say you’re A okay! am trying to get a concrete answer on the xantham gum I wrote them, but my community on facebook says it’s okay…I’m hoping (it’s the weekend) I get a reply during the normal work week..
Pingback: Thai Inspired Chicken – The Writer Eats. Is it healthy? I don’t think people are going to drink it or make a soup out of it. They probably just want to drizzle a little on top of some vegan tacos. Try not to be so judgemental- all things in moderation.